Note: this post originally appeared on the Practicum: Critical Theory, Religion and Pedagogy blog. An undergraduate religious studies class is a social group that examines and critiques other social groups. A critical-theory-minded undergraduate religious studies class is one that takes this fact as part and parcel of its scholarly work. Attention to this fact raises questions about what type of knowledge is being produced, why it is being produced, under what conditions it is being produced, and how it is quantifiably different than the knowledge produced by the groups being studied. I say “how” rather than “whether” very intentionally: the goal of scholars in the field of religious studies is not to merely repeat (or teach our students to repeat) the mantras, texts, and histories produced by our subject matter. To re-appropriate Bruce Lincoln’s terminology, as instructors, we are not training amanuenses, collectors, friends, advocates, cheerleaders, voyeurs, or retailers of import goods – we are attempting to train producers of scholarship and/or critics. The goal of the classroom, then, ought to be producing knowledge about social groups without getting ahead of ourselves – without taking our positions or the positions of our subject matter (along with the material processes that render them possible) as natural or given. While teaching, I have found the process of self-reflection to be a helpful way to illustrate many of the theoretical claims that I make over the course of a semester – from the arbitrariness of social norms and their enforcement (why do I take off participation points for arriving 15 minutes late rather than 14 minutes? 13?) to the material production of specific types of knowledge (and the processes by which actors designate some knowledge as scholarly, some as scientific, some as religious, and some still as secular). However, a consistently self-critical perspective can lead to conceptual difficulties – how do we go about producing critical scholarship about social groups while keeping in mind our status as members of a social group? What sort of balance can we strike between analysis of course material and analysis of course structure/function? In order to avoid leading a course on navel-gazing, the reflective process needs to complement or explain the analyses at hand rather than act as stand-alone sections of the class. In a course called “Religious Ethics and Moral Dilemmas,” I devote the first lecture solely to addressing the labor and space of the classroom using a couple of Antonio Gramsci’s essays on “The Intellectuals and Education.” These essays helpfully provide a vocabulary and orientation for returning to “the classroom” as exemplum throughout the semester in order to complement rather than distract from other course material. Gramsci’s essays set the tone for the rest of the semester. If we, as a class (in both senses of the term), take as our first object of analysis the class differences stabilized under the labels of “intellectual” and “manual” labor/space then we are critiquing familiar ground. From here, we can look at the various methods by which this time and place are set apart (printed course schedules highlighting “class time”, syllabi that describe “knowledge goals”, or references to out-of-classroom assignments as home “work” juxtaposed with in-class “lectures”, “discussions”, or “activities”). This will serve us well as a reference point when we examine the maintenance of various other binaries in ethical discourse (law of God/laws of man; sacred/profane; terrorist/soldier) later in the semester. Gramsci’s essay has the further benefit of emphasizing the social consequences of classroom activity, noting that the students aren’t simply learning information, but are learning a specific mode of doing so. For instance, what are the social consequences of being trained to listen to lectures and complete readings in order to recall bits of information in multiple choice format? This reading/discussion/lecture begins the semester by situating the classroom firmly within the social world by challenging students and lecturer to examine and critique the discursive practices in which we are participants. We return to these themes several times in the semester (particularly when discussing the role of academic ethicists in public policy making and whether there ought to be a difference between an “ethicist” and a “scholar of ethics”) and use the categories of class, labor, and intellectual to help make sense of in-group/out-group moralizing. It takes work, labor, to perpetuate and enforce a certain vision of the good within any given social group. This labor requires classes of people: those who repress dissidents; those who choose, celebrate, and extol exemplars; those who are disciplined; and those whose challenges to the moral status quo are eventually accepted (among many others). I address the scholar’s role in these class struggles at the beginning of the semester in order to avoid naturalizing the scholastic point of view and challenge the idea that what we do in the classroom is somehow disconnected with the social world being analyzed. If the religious studies instructor’s job is to problematize discourses that assume an apolitical space, asocial labor, or universalize a set of contingent behaviors or structures by labelling them “good”, “just”, or “sacred”, we would do well to begin by theorizing our classrooms. Gramsci, Antonio. 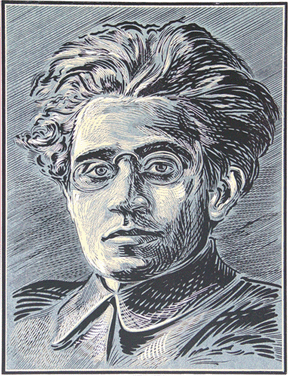 “The Intellectuals and Education.” The Antonio Gramsci Reader: Selected Writings 1916-1935. Ed. David Forgacs. NYU Press: New York, 2000. Pages 300-322. Lincoln, Bruce. “Theses on Method.” The Insider/Outsider Problem in the Study of Religion. Ed. Russell McCutcheon. Cassell: London, 1999. Pages 395-398. Tommy Carrico is a doctoral student at Florida State University where he studies comparative religious ethics, political economy, and theory and method in the study of religion. This entry was posted in Uncategorized and tagged Antonio Gramsci, Bruce Lincoln, Tommy Carrico. Bookmark the permalink.